Similar to last week, this weeks card features flowers. 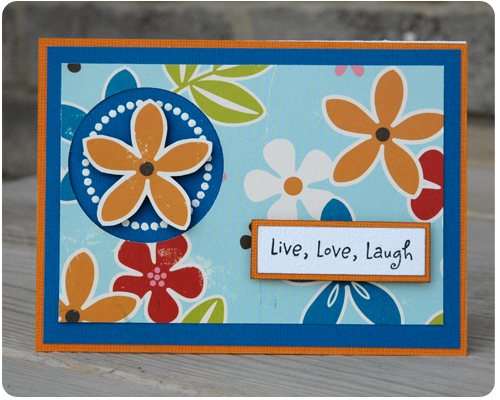 After layering the papers on this card, I wanted to add some sort of embellishment but quickly found that I had nothing in my stash that coordinated. To solve this problem, I simply cut one of the orange flowers out of a small scrap of the same floral paper used on the card. I then punched a circle out of the floral paper on my card, stamped and heat embossed another circle inside my punched circle, and attached my orange flower with a foam square to give it some dimension. I had created the perfect embellishment. I often do this - cut things out of patterned paper and use them as embellishments - even when I am working on scrapbook layouts. Yes, it is a little time consuming, but it saves the pennies in that I can get a perfectly coordinated embellishment without paying any extra for it. Is this something any of you do? It is a really handy little trick, that I highly recommend. These are super cute cards! The remind me of Hawaii a little bit. My aunt would go nuts for them! You are right, this card does have a tropical/beach feel. Your card is so fun looking! Yes I have cut images out of the paper and used them for embellishments as well! The cut images are great to even embellish before they become an embellishment! Thank you Krystie! Great idea to embellish the cut image before attaching it to your project. I love the colors, so bright and cheerful!